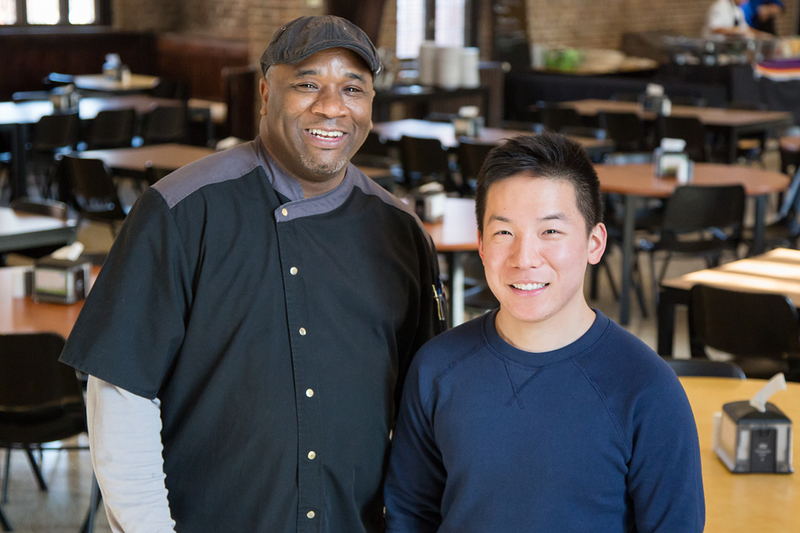 Jason Yue, a senior in engineering, and Eric Pursley, a Presby Hall chef, became friends when Yue first started out as a resident adviser for Presby. Yue, who’s been helping those he meets fulfill their bucket lists, took Pursley flying for the first time. The video, posted in September 2015, has received more than 518,000 views. Jason Yue holds his cell phone up to the camera. It’s 5:32 a.m. and his friend Eric Pursley, a Presby Hall chef at the University of Illinois, has no idea he’s about to fly in an airplane for the first time. More than half a million YouTube views later, his video of Eric’s first flight began a project to help others cross off items on their bucket lists, documenting everything on camera. “Jason’s List” is his way of telling stories about people he’s met since arriving on the Illinois campus as a freshman. Inspired by a Facebook page he created focusing on the “Humans of Champaign-Urbana” and conversations with strangers on long bus trips, Jason started a YouTube channel to tackle his personal bucket list, with to-do items like helping a friend propose to his girlfriend and learning how to skateboard. He wants to help others fulfill their bucket lists, too. Jason stops by the Presby Hall dining hall several times a day, he said, and catches up on his day with Eric. He learned Eric had a yearning to fly, and Jason thought his friend’s wish would be a great place to start. One of Jason’s most recent videos features Miyani, an 11-year-old from the Champaign- Urbana area with special needs. He dropped by Miyani’s house under the pretense that he’d be filming part of his documentary about happiness. Then Jason broke the good news – the cost of Miyani’s after-school program would be taken care of for the year. He said he paid for Miyani’s after-school program expenses with YouTube ad revenue from his video about Eric, reallocated funds from a winter break trip overseas and savings from his math tutoring job. Jason had planned to attend Northwestern University up until May of his senior year, but said he ultimately chose Illinois because it’d be less of a financial burden on his parents. As a member of the Student Alumni Ambassadors program, he said he’s come to love Illinois. You’d have to love Illinois if, like Jason, you’re willing to slather yourself with green paint and dress up as Labor, one member of the figures (Learning, Labor and Alma) depicted in the iconic Alma Mater sculpture. Jason didn’t come to Illinois for filmmaking, but said he gained mentors in both the College of Engineering and the College of Fine and Applied Arts who’ve affected his video-making. While taking engineering professor emeritus Ray Price’s emotional intelligence course, Jason said he’d stay once a week after class for the entire semester asking Price questions, and coming away with even more questions about how to be a better listener. He met professor Kimber Andrews through her writing for video course, and she introduced him to a documentary filmmaker who was visiting the area for a screening. Through that connection, Jason said he now plans to work for a small production company in New York City this summer. Does Jason know what he wants his impact to be? “I think I’m most effective when I’m having one-on-one conversations, talking to people,” he said.